Halifax FA Saturday Cup holders Huddersfield Amateur face a tough start to their defence of the Albert Crabtree Cup. 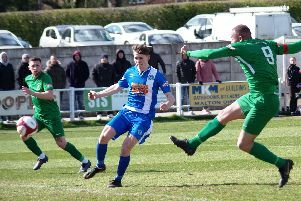 The Elland side, 9-2 winners over Warley Rangers at the Shay in late April after losing in the final to Ryburn 12 months earlier, have been drawn at home to Brighouse Town in the first round. Evo-Stik NPL club Town, previous winners of the competition, have strong resources at Hove Edge and may field largely their under 21 side. Halifax AFL champions Illingworth St Mary’s will be expected to overcome Copley United but a couple of Premier sides face tough tasks against non-AFL opposition. Midgley United must travel to play Ealandians while Hebden Royd Red Star at least have ground advantage against reincarnated Ovenden West Riding, multiple winners of this competition and in flying form already this season. There is an all-Shelf derby between United and Premier newcomers Shelf FC, the Challenge Cup holders. Halifax FA Albert Crabtree Cup, first round draw: Ealandians v Midgley United, Hebden Royd Red Star v Ovenden WR, Flying Dutchman v Mixenden United, Huddersfield Amateurs v Brighouse Town, FC Ovenden v AFC Crossleys, Elland Allstars v Warley Rangers, Illingworth St Marys v Copley United, Salem v Stainland United, Calder 76 v Sowerby Bridge, FC Plummet Line v St Columbas, Junction Inn v Brighouse Sports, Ivy House v Northowram, Greetland v Holmfield, Shelf United v Shelf FC, Ryburn United v Sowerby United. Bye; Brighouse OB. Matches on Saturday, October 21 (1-45pm).